Born in England, Dr. Onuoha grew up both in England and Nigeria. She obtained her medical degree at the University of Bristol, England in 1996. She worked in various capacities throughout England before traveling to Shepparton, Australia with her husband, Dr. Nwosu, in 2001. Together they spent a year in Shepparton as emergency room physicians before relocating to New York City. Board certified in internal medicine, Dr. Onuoha completed her residency in 2008 at Maimonides Medical Center in Brooklyn, New York. After that, she and Dr. Nwosu made their way across the U.S. until they put down roots in Mesa, Arizona, where Dr. Onuoha worked as a hospitalist at Mountain Vista Medical Center before helping to establish Stripes Primary Care with her husband. She is well loved by her patients and best known for her patience, kindness, and wisdom. Drs. Onuoha and Nwosu have five children. She enjoys cooking, going to church, and helping everybody in any way she can. She is also involved with funding and running Stripes International Academy in Nigeria, which she founded with her husband. 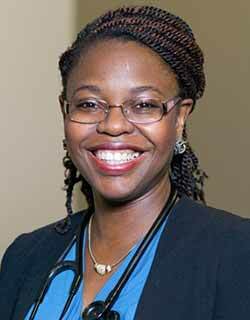 Dr. Onuoha has a tremendous amount of experience from working in several parts of the world, which she now brings to Stripes Primary Care. Born in Nigeria, Dr. Nwosu obtained his medical degree from the University of Nigeria — Nsukka in 1994. He then practiced pediatrics in Gambia until he moved to London, England in 1998, where he met and married his wife and partner in practice, Oyoyo Onuoha, MD. Instead of going on a honeymoon, the pair traveled to Shepparton, Australia on a working holiday, where they practiced as emergency room physicians for a year. In 2003 they moved to New York City, where Dr. Nwosu completed his internal medicine residency at Interfaith Medical Center in Brooklyn. 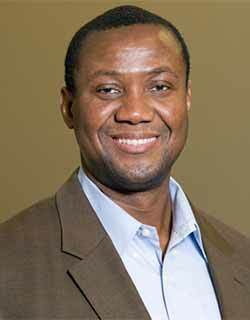 Following his residency, Dr. Nwosu worked in several hospitals and clinics including St. Francis Medical Center in Cape Girardeau, Missouri; Banner Thunderbird Medical Center in Glendale, Arizona; and Mountain Vista Medical Center in Mesa, Arizona. He is board certified in internal medicine. Drs. Nwosu and Onuoha established and continue to fund a primary school — Stripes International Academy — in his hometown village of Ihite-Ude Ofeme, Abia state, Nigeria as a way of giving back. With his younger brother, Ugo Nwosu, he also established a transport company to help alleviate the suffering of rural villagers during their commute into Umuahia City. Dr. Nwosu is also involved in his local churches both in the U.S. and in Nigeria. He and Dr. Onuoha have five wonderful children. A compassionate and highly skilled doctor, Dr. Nwosu brings a wealth of experience acquired from working in different countries to Stripes Primary Care, which he co-founded with his wife in 2011.